Sometimes it’s because you’re bored, sometimes it’s because you’re tempted, and other times it’s because you’re genuinely hungry and dinner isn't for another 2 hours. Or you might call yourself a grazer — one who prefers to snack throughout the day instead of eating square meals. Whichever type of snacker you are, we're here to give you some ideas for foods to have on hand so that your next snack helps you get youthful, unclogged, beautiful skin. 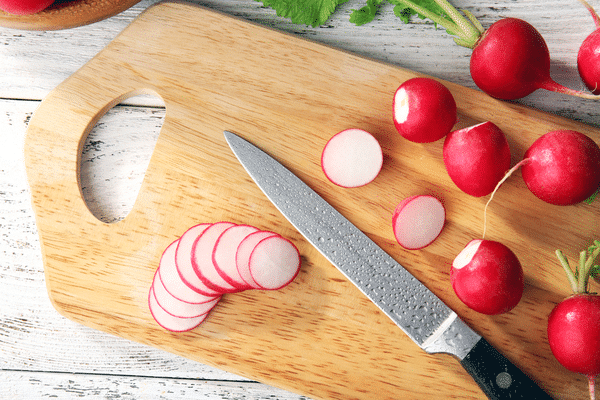 High in water, radishes help fill you up and hydrate you. Their high zinc and phosphorus content, as well as their ability to help you detoxify, makes them a skin ally. Abby, our in-house esthetician, recommends slicing them and eating them plain or dipping them into tapenades or hummus. Feeling the need to indulge? Now that the holiday treats have (most likely) disappeared, you can replace them with a healthier alternative. Apples are kind of the unsung heroes of healthy skin and they're rich in boron. They also have silica, which is pretty much the holy grail of skin ingredients. Silica is responsible for the overall health of your hair, skin, and nails. Lisa loves making a simple plate of sliced apples with a side of peanut butter, shredded coconut, and dark chocolate chips. (You could also do cacao nibs instead.) Then you can dip the apples the peanut butter and top with the other two. You could also top with nuts or anything else your taste buds fancy. Lisa loves desserts of all kinds. Not too long ago, we posted one of her favorite fall recipes for Caramel Apple Nachos. She has an eye for yummy, healthy recipes and all-encompassing kitchen talent. She recommends this recipe for “Chocolate Snowballs,” a no-bake treat that combines ripe bananas with cocoa powder and other yummy things. So even if you lack in the kitchen talent department, you will have no trouble whipping this one up. Cocoa powder is full of antioxidants, which are great for your skin. This recipe uses some maple syrup to sweeten, which is one of the healthier sweeteners. That means that this dessert will satisfy your sweet tooth without spiking your blood sugar and contributing to sugar-induced aging. No bake cookies are often a healthier option, because they let you ditch the flour and eggs and allow the healthy and raw ingredients to shine. Carly’s favorite recipe comes from Frugal Farm Wife and uses a simple combination of peanut butter, oats, cocoa powder, and a few other ingredients to create a raw cookie that’s chocolately, creamy, and also really nutritious. She says you can sub in whatever nut butter you have on hand. Oats are high in iron, manganese, phosphorus, and fiber, and are an easy thing to throw into smoothies and desserts to make them more nutritious. Aka, trail mix. Aubrey likes to enjoy it as was intended: while she’s hiking or camping. She loves spending long hours in the forest looking for herbs to wildcraft and spending time with the world's creatures. This means she often forgets to factor mealtimes into her days. She always has trail mix around for these times. You might want to keep some in your desk to satiate you throughout your day. A small handful of trail mix gives you a lot of energy (calories), so reserve it for when you’re truly hungry and keep it to a couple handfuls a day. Some grocery stores have bulk sections, where you could all these ingredients and make your own custom mix. Sites like Nuts.com also carry many of these ingredients (that link also has some good ideas for healthy snacks). Chia is all the rage right now. It’s a trend worth following, and those that eat it regularly can tell you that it provides long lasting energy. It’s also a great skin food. This seed has tons of fiber, which helps to move things through your body. Combine a high fiber diet with lots of water and you’ll be moving things along superbly. This takes a load off your skin! Chandra’s favorite way to enjoy chia is in Chia Pods, which she describes as somewhere between pudding and custard. This is her go-to when she’s craving sweets. What’s even sweeter is that the company has a triple bottom line approach to sustainability. Clearly we are on the same page with our food preferences, because Courtney also recommended snacking on chia. She recently discovered these chia-filled yogurt cups, made from a company that sources milk from grass fed, pastured cows. If chia pudding isn’t your thing, this is a great way to enjoy it. The company is aptly named The Epic Seed. Chips and salsa might not scream ‘healthy snack’ to you, but choose the right chips and it can actually be an awesome way to get more veggies into your diet. Rachel’s go to is this fermented salsa by Wild Brine. She does warn that it’s a little pungent, but it’s delicious and full of healthy probiotics. Fermented foods help keep your gut healthy by adding good bacteria to it. We cannot stress enough how important gut health is. Keeping your gut health helps you avoid inflammation, which is the root of many illnesses and also takes a toll on your skin. She eats this salsa with chips made by Forager, which are not yet listed on their website but available in some Whole Foods Markets. If you make your own salsa, you can enjoy a fresher product and tons of nutrients. 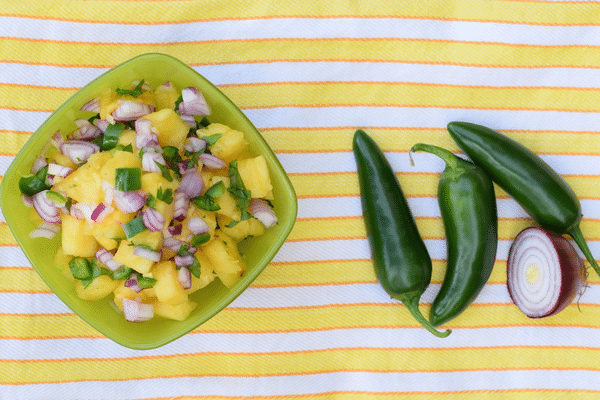 Hope likes to make spicy pineapple pepper salsa that's delicious and also super high in vitamins A and C (which are your skin’s best friends). It’s also great if you have a cold coming on, not only because it’s vitamin rich, but also because the jalapeno helps clear your sinuses. Mix all ingredients and enjoy. It gets better after sitting for a couple hours so the flavors can mingle. Hope recommends leaving the ingredients chopped and not blended, so you can see all the colors. Plus, it makes for a crunchy salsa with dynamic flavor bursts. Want to meet our team? Click here to learn more about us. What's your favorite healthy snack? Tell us in the comments below! The more that one reads the more they will find the great bebefits of fruit and raw vegtables. A cheaper and healthier way to go than wasting money on chemicals at the perscription counter and skin care counter. When it comes to food, I’m very picky. In fact, I do a research first about it if it’s really good for my health and my skin. Good thing I’ve found this list of yours. Now I can really say that I’m doing the right thing. I just don’t want to take for granted my skin in the first place because like everyone else, I also want to have a healthy glowing skin. Thanks for sharing the list of food. This may seem like a lot of work (it really isn’t) but I have been having fantastic results from my homemade bone broth. It just some beef bones (grass fed), some veggie scraps, salt & pepper, Braggs vinegar and lots of water all put in a slow cooker for 1-2 days. All that collagen is working magic for my skin and I’ve only started drinking it about 10 days ago. In due time, my joints and nails will love it as well. Ohh no, I am in this psge because I read its cruelty free policy, products are vegan except for honey and beeswax, now I read this… Bones from grass fed gorgeous, beautiful animal..no I dont need to kill a creature to be beatifull, my nails are good asthey are..and will stick to non animal abuse lifestyle. Gabrielle, thanks for the encouragement. Just finished reading Brodo which I found quite by chance at the bookstore. It was interesting to read and quite motivating so I’m seriously thinking of making bone broth on a regular basis. Actually, had bought some veal bones before finding the book but gave up and threw them out. Will have another go at it thanks to you and Brodo, the book. We also make our own broth, in a pressure pot. We do beef, pork and chicken. It is the only way to go. i like it because we know for ourselves exactly what is in it. We now enjoy the benefits of bone marrow which has been missing in our diet for years. My doctor and my cardiologist have both said to keep doing what we are doing for continued good health.